All areas of the Nursery School, downstairs, upstairs and the garden are accessible to children aged 3 to 5. The garden is shared with children from the Orchard Room which offers rich opportunities for children aged 0 to 5 to learn together. Staff plan a balanced range of opportunities and enable young children to develop their own interests. Young children need an environment which offers opportunities to repeat experiences over time in different contexts to secure their understanding and development. 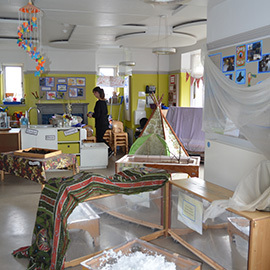 The environment, both inside and in the garden, is arranged in workshop areas linked to the curriculum. Each of these workshops has the potential for children to explore many areas of learning. Staff ensure that the range of equipment and activities offer a progression of opportunities and challenge for all children. Workshops are arranged to promote learning e.g. 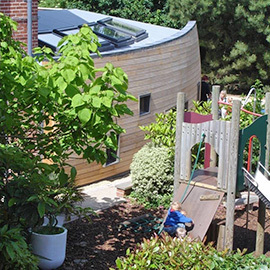 furniture and equipment are set out to allow children to move around easily and safely between areas and from the building into the garden, links are made between the activities and equipment e.g. placing books and graphics resources near to each other to provide examples of meaningful print. A secure daily routine ensures that children can make informed choices about the best use of time available, subject to staff guidance where appropriate.